Tomatoes, especially heirloom tomatoes are one of my favorite things to eat. Since April, I have been on a journey of weight loss, so my blog has been somewhat neglected. It is hard to shift gears from the “eat anything” mentality to eating mostly gluten free and mostly dairy free foods and juicing fresh fruits and vegetables. So far, I have lost a little over 20 pounds since April. After a week long vacation and a week of over indulgence, I am getting back on track again. Here is an heirloom tomato salad I made for lunch for my husband and myself. I will make this again. 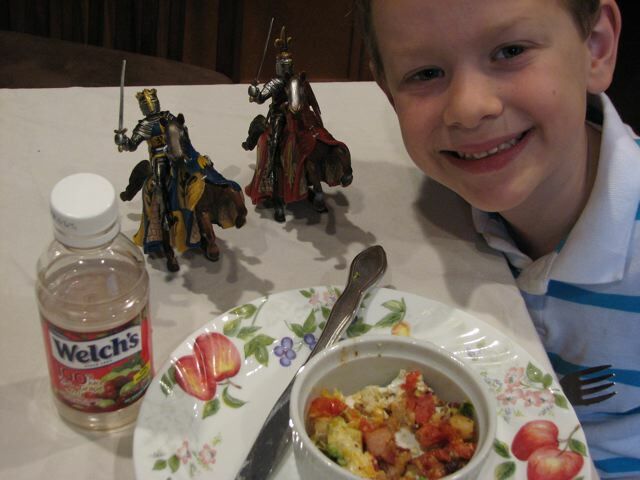 It is both simple to make and delicious to eat. Thinly slice the heirloom tomatoes into large disks. I used three different color tomatoes and alternated the colors on a plate, overlapping the tomatoes a little bit. I placed basil leaves between the slices of tomatoes. Sprinkled with salt and pepper, and then drizzled the balsamic vinegar over the top of the tomato slices. I placed the mozzarella balls next to the tomatoes. My husband and I both enjoyed the heirloom tomatoes. 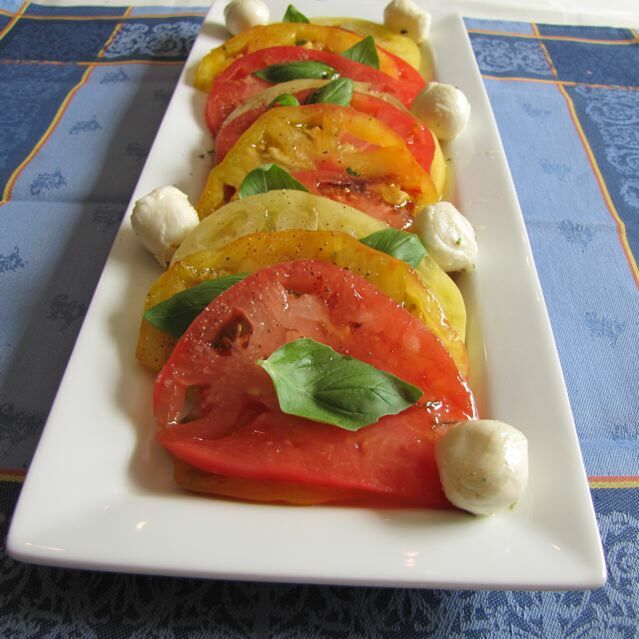 Categories: Eat Fresh!, Side Dish - Salad, Side Dishes | Tags: Heirloom Tomatoes, tomatoes | Permalink. My husband had his birthday last week. Today it is Birthday Observed. 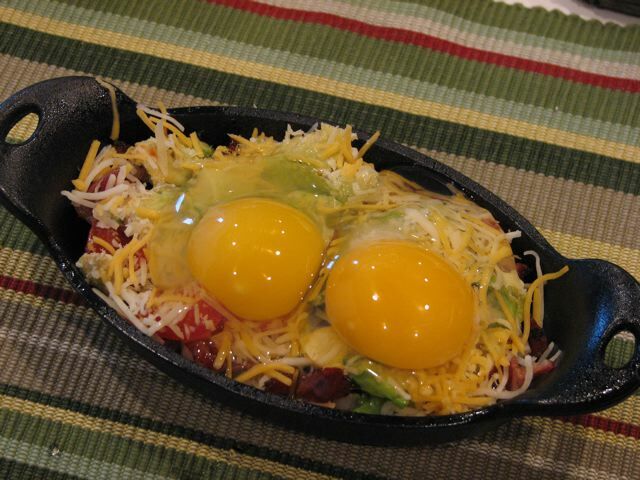 It started with my egg skillet breakfast that was inspired by another picture on foodgawker. I made my own changes. 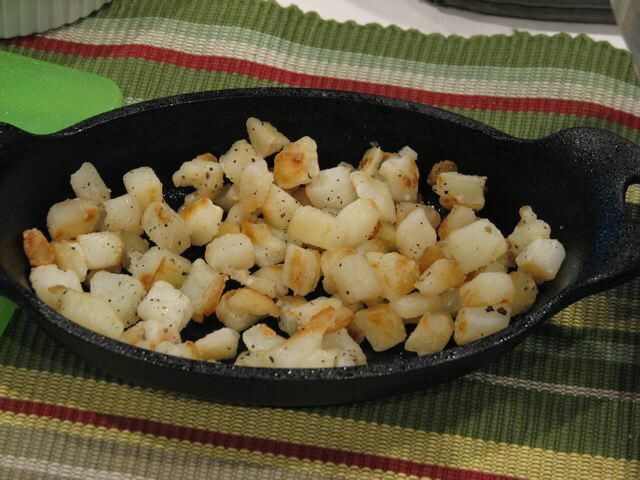 I prepared the hash brown potatoes in a non stick skillet over high, turning occasionally. This process took about 10 minutes. Depending on your taste it may take longer or shorter. Season them with salt and pepper. When they are golden brown scoop them into a bowl and set aside. 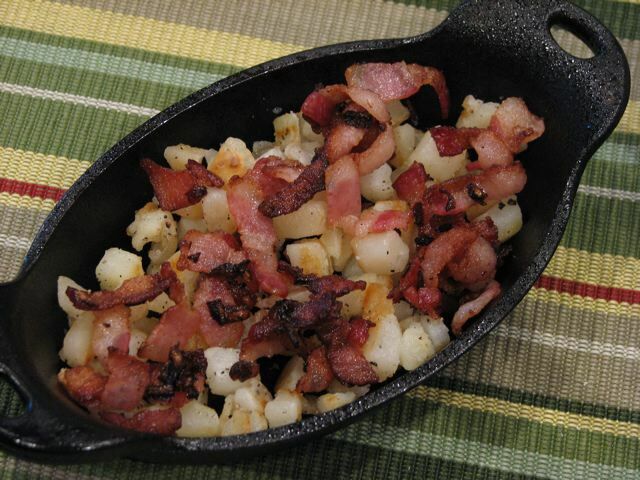 Use the same skillet to cook up the Onion and bacon pieces over medium heat until they are crisp. 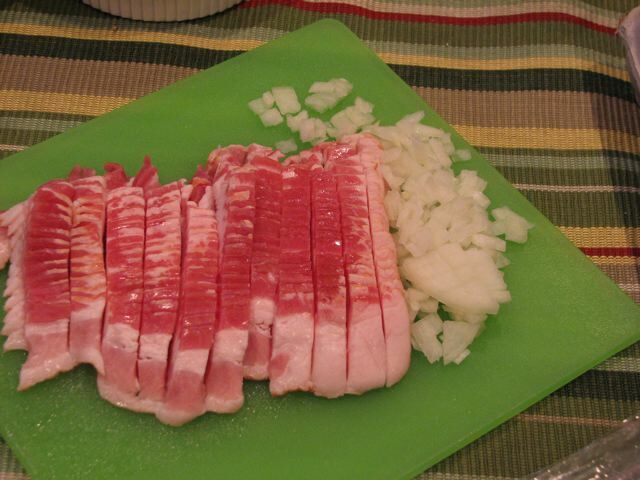 Remove the bacon and onion with a slotted spoon and let them drain on a few paper towels. 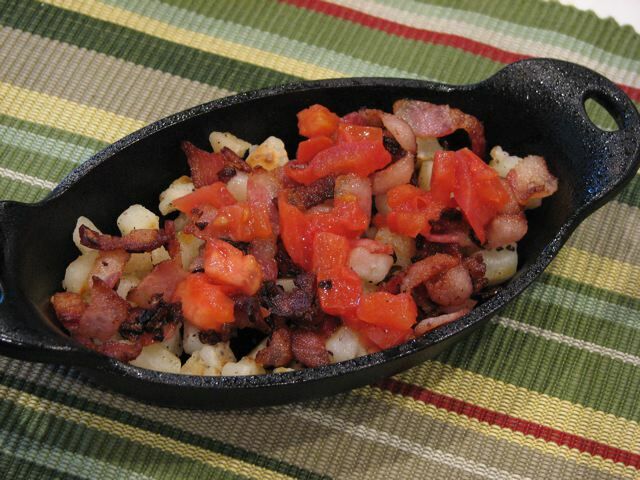 Wipe out the skillet with a paper towel and put the chopped tomatoes in to just cook a minute or two. 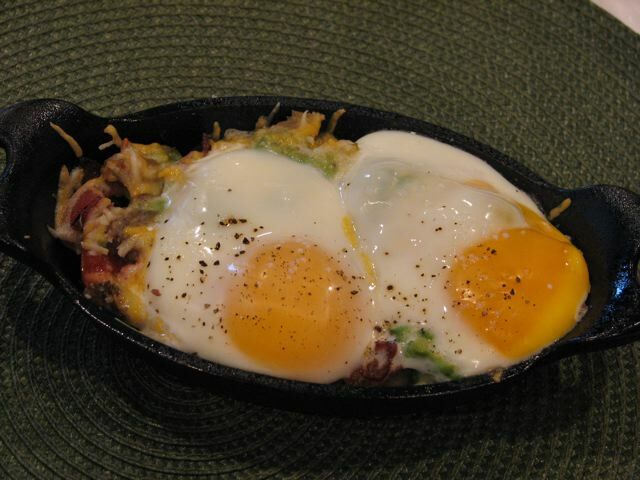 Spray a ramekin or cast iron skillet with cooking spray. 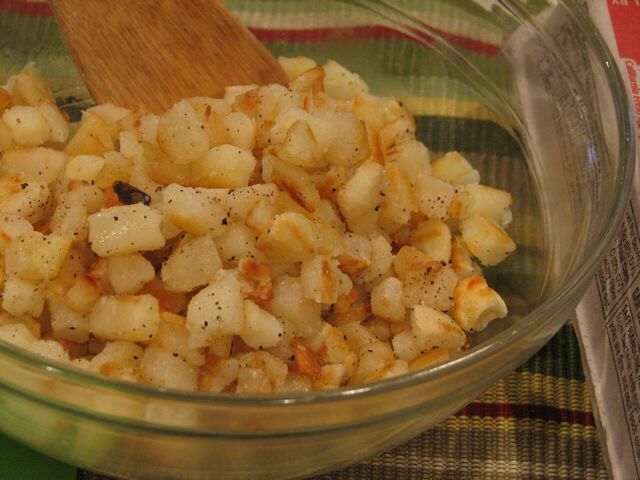 Layer the bottom with some hash browns. Just enough to cover the bottom. 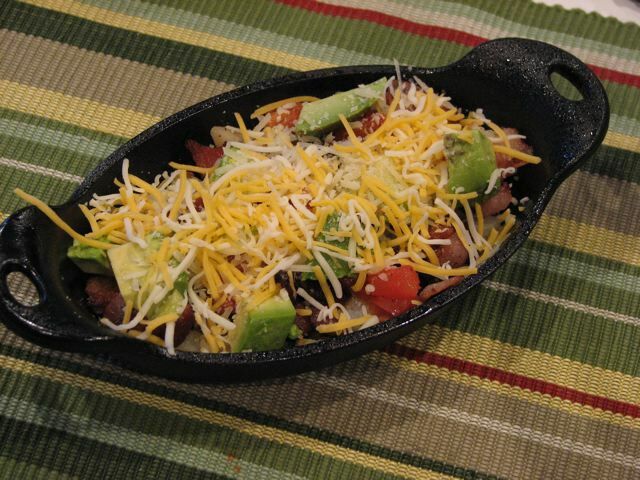 Top with bacon and onion, tomatoes, diced avocado, sprinkle with Colby Jack Cheese. Crack and egg and put on top (you might want to make a little well so the egg does not decide to go to the side). Place ramekins on a cookie sheet and put in preheated oven. Bake for 15-20 minutes to desired doneness. The egg white should be cooked but the yolk still a little runny. Season with salt and pepper. Serve. 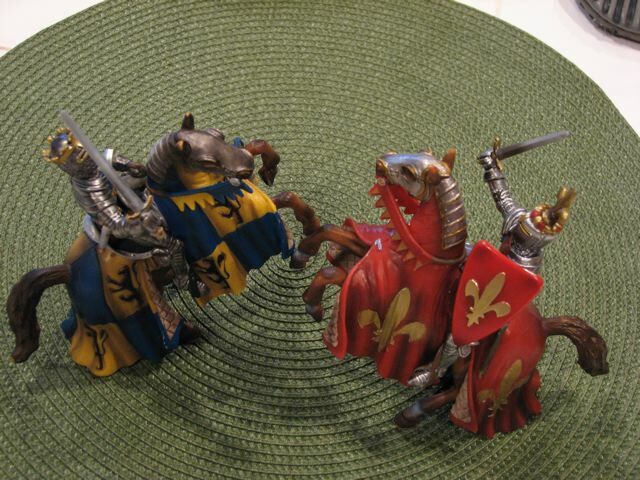 Warn the little ones that the dish is hot. My husband said it was worthy of a Birthday Breakfast. That is all I needed to know! Now that is a picture of a satisfied customer. 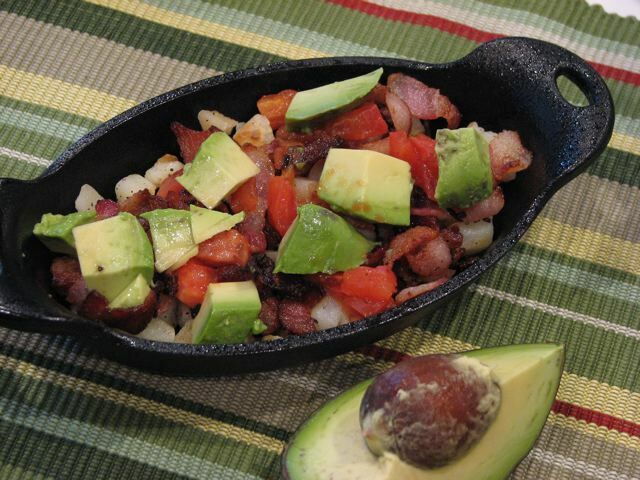 Categories: Breakfast, Breakfast - Eggs, Favorite | Tags: avocado, bacon, Breakfast, cheese, Egg Skillet Breakfast, Eggs, Food, haas avocado, hash browns, potatoes, Recipe, Skillet, tomatoes | Permalink.